Spray three nine-inch round cake pans with nonstick baking spray. Preheat oven to 350°F. In a standing mixer bowl, sift together flour, sugar, baking powder, baking soda, and salt. To the dry mixture add eggs one at a time, then oil and lime juice. Mix on medium until creamy, about one minute, and remember to scrape the sides. Lastly, add sour cream and zest. Just mix until combined and smooth, about a minute. Pour cake batter evenly into cake pans and bake for about 25-35 minutes or until a toothpick comes out clean. When done, allow to cool in pan for 5 minutes then turn cakes out onto cooling racks. Let stand to cool completely about 1 hour. Then using a long bread knife, slice each layer in half. I will sometimes put the cake into the freezer for about thirty minutes after it has cooled to make it easier to cut. Now ice all layers of the cake with cream cheese icing and stack. 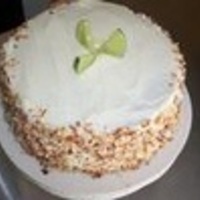 When cake centers are iced, ice entire cake with cream cheese icing and coat with toasted coconut all around the outside. Garnish with fresh lime slices, cut three in half on the top in the center to resemble a flower. Cream cheese icing to follow. In a standing mixer bowl, cream together cream cheese and butter. Add vanilla and key lime juice while mixing. Slowly add confectioners’ sugar mix until creamy and spreadable and fold in zest. Ice between all layers and entire outside of the cake. Place coconut in a large skillet over medium heat for about 5 minutes, fluffing with fork, and watch closely until golden brown. This cake is absolutely delicious!! I made it for my one year olds first b-day and it was such a hit. Everyone loved it! It was very moist and super flavorfull. I however did not get three rounds out of it, but only two which rose to about 1.5" height. It was fine with me and we all loved it. I did also have a lot of extra frosting (which isn't a bad thing :)) This cake is a keeper for me, it's worth every ounce of effort put into it. Thank you for the post! Melinda's cake certainly is a WINNER! I changed it slightly and left out the cocnut and made buttercream icing with lime rind instead and it was beautiful! A big hit at work for my boss's bday. Thanks Melinda! The cake is wonderful and refreshing!! It taste like a breath of fresh of air. I altered the icing recipe by reducing the amount of sugar by 1 lb., yes I did say 1 pound. It was great!! I used this for my friends graduation party with a beachy theme of "Crab Boil/Easy Living" Key Lime appears to be the fav for beachcomers. I usually stay with traditional recipes, but I am so glad that I tried it. I have had several people request your recipe. Thank you. I tried an almost exact recipe (except it used creamed butter) in a bundt pan. It fell and was hard edged yet undone in the middle after 60 minutes at 350d. Any ideas? Made this cake twice now...I used 2 boxes of white cake mixes with 2 10inch pans...cut cakes in two...otherwise followed this recipe...cant say how delicious it is!!!!!!!!!!!!!! everyone asks me to make for their birthdays. The next time I have a special occasion (especially with Spring and Summer right around the corner) I am going to make this cake! We LOVE Key Lime Pie, so this cake should really be a winner in my household!